Lady Anne’s Way is a classic long distance walk extending for 100 miles from the rugged limestone countryside of the Yorkshire Dales, to the unspoilt villages of the Eden Valley. The trail was conceived as a tribute to Lady Anne Clifford, who devoted her life to the restoration of her castles, churches and monuments along this route in the 17th Century. From Skipton Castle in North Yorkshire the path runs north to the ruins of Brougham Castle on the outskirts of Penrith. The Way takes in sections of the Dales Way in Wharfdale and the ancient green lane known as Lady Anne’s Highway along Mallerstang, visiting Lady Anne’s historically significant buildings along the route. The varied nature of this trail makes it appealing to both seasoned walkers and those seeking their first experience of a long distance hike. Starting with easy walking along the banks of the river Wharfe the route then takes a high path over the fells from Wensleydale into Mallerstang with its wild and dramatic scenery. Entering the Eden Valley the trail from Kirkby Stephen to Appleby is along soft flowing rivers leading through scenic villages on the way to Penrith. We offer a range of walking holidays along Lady Anne’s Way. Enjoy 6 to 9 day self-guided walks along the entire length of this classic trail, or walk the Highlights of the Yorkshire Dales and Vale of Eden as separate routes of between 4 and 6 days. We offer 3 holidays covering the whole route. You can choose from 6, 8 or 9 days depending how far you want to walk each day. The route does include remote moorland sections therefore it is worth bearing in mind that the 6 day hike is quite a challenging undertaking that serious walkers will enjoy. Concentrating on the dramatic and rugged section of Lady Anne's Way through the Yorkshire Dales, this route starts by following the river Wharfe along ancient tracks into Wensleydale. The path then takes the high route over the fells known as Lady Anne's Highway into Mallerstang, finishing in Kirkby Stephen. This is a delightful route that starts from Hawes along the Lady Anne's Highway in the Yorkshire Dales. The trail then leaves the rugged moorlands behind with easy walking along the river Eden through lush green pastures and picturesque villages to finish at Brougham Castle near Penrith. Despite distances being short, there is plenty to see with time to explore the villages, churches and towns enroute, or simply to take in the views along the way. Walk through the wild and dramatic valleys of Wensleydale and Mallerstang in the Yorkshire Dales. Enjoy the scenic villages and lush pastures of the Eden Valley. 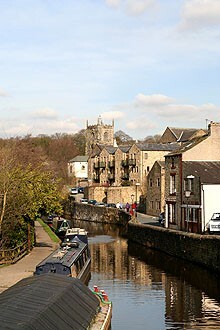 Visit historically significant buildings along the way as the route travels between the castles of Skipton and Brougham.